Judy Fuegner, a dispatcher at GetAbout Inc., plans the schedule for the day. Picture taken Feb. 9, 2018 in New Canaan. NEW CANAAN — Todd McInerney wakes up at around 6:30 a.m., breakfast and short workout routine included, to get ready for his day. McInerney, a fiercely independent man with disabilities, lives at South Avenue Cottage and his desire to work and engage with others are some of his defining characteristics. A dishwasher at Grace Farms for three days of the week, McInerney began his job in Oct. 26 of last year. He describes his routine meticulously, detailing how he verifies that the dishes are “squeaky clean” after he takes them out from the dishwasher machine. McInerney does however need help to get to work — a GetAbout Inc. driver picks him up from the New Canaan STAR Inc. office at 11 a.m. to take him to Grace Farms where his shift ends at approximately 1:30 p.m.
STAR Inc., a nonprofit that provides support services for individuals with developmental disabilities, recently inaugurated its New Canaan branch office in December of last year making the organization’s services more readily available for clients in the town. STAR has two additional offices, including its main office, in Norwalk. GetAbout Inc. relies on donations from residents and various foundations. If interested in donating, you can call 203-972-7433 for more information. ”I really enjoy being in this office, it’s much closer to me,” McInerney, a New Canaan resident, said. GetAbout Inc. is a nonprofit organization that provides free rides for pick-up and drop-off services for residents in New Canaan and surrounding towns. Michael Hodges, 33, is the youngest driver at GetAbout and has been working part-time for nine months. On Feb. 13, Hodges was waiting to pick up two STAR clients, Steven Caird and Jassinia Mysogland, who both work at the ACME Market on Elm Street. According to New Canaan branch Employment Manager Shelby Grich, STAR clients rely on GetAbout’s services to go to their work around town at places that include Grace Farms, Garelick & Herbs and ACME Market. The effort to manage several drivers’ schedules involves around the clock monitoring. On a busy day, GetAbout can schedule almost 50 rides according to GetAbout board members Matt Hannon and Bill Post. 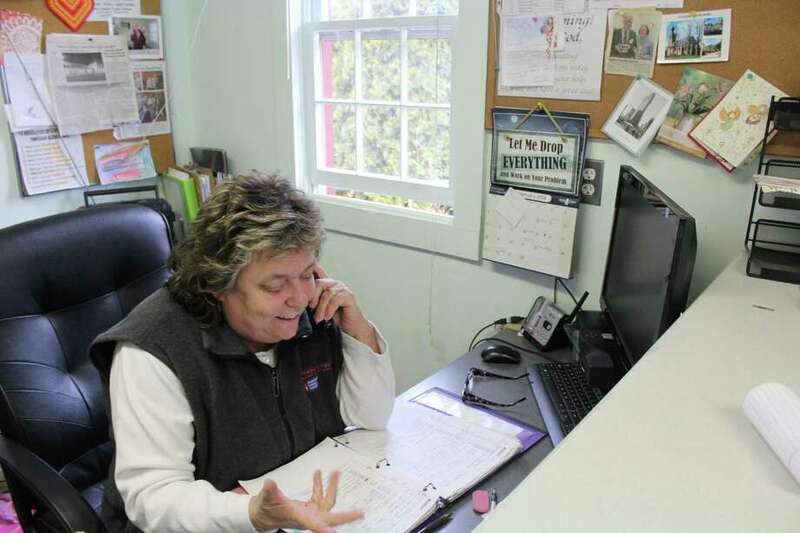 Fuegner, who is in charge of coordinating schedules and communicating with all the drivers, is constantly on the phone throughout her working hours from 8 a.m. to 4 p.m at the organization’s office adjacent to the New Canaan train station. Fuegner monitors the drivers’ schedules via a cloud-based software program that they can see on their individual tablets. Donald Merchant has been a part-time driver at GetAbout for four years. All the vans that GetAbout uses are handicap accessible and include ramps for those individuals who need a wheelchair. In order to fund their services, GetAbout receives donations from local merchants, largely-caring individuals and holds a fundraising event in the fall, according to Fuegner. “We’re different because we drop-off and pick-up clients. People wouldn’t be able to go otherwise and we serve the whole thing,” Fuegner added.